Andrew Lane, the Monmouth based furniture designer, has designed the Eisteddfod Chair for 2012. 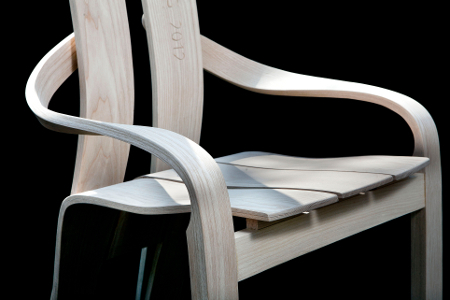 This special commission was to create the official chair, awarded as the poetry prize for the winning Bard at The National Eisteddfod of Wales 2012. The festival committee cited that Andrew’s ideas for his design fitted the ethos of the festival and that his previous work demonstrated that he would bring a fresh perspective to the design of the Chair. The commission was a fantastic opportunity to explore ideas and techniques around this year’s festival theme of The Flow of the Tide. 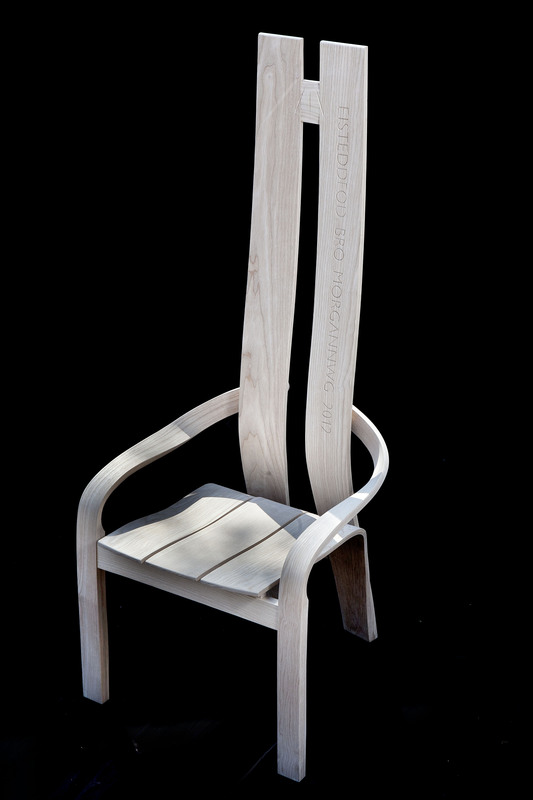 The chair was designed over a three month period during which Andrew decided to approach its design in a similar way to that of writing a poem. 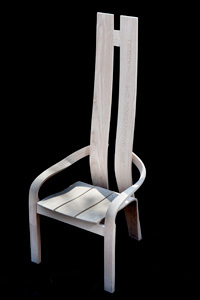 Just as a poet seeks to make connections between words and phrases and in so doing creating different meanings and overall effect, so Andrew planned the components of the chair would combine to form a piece of unique furniture. 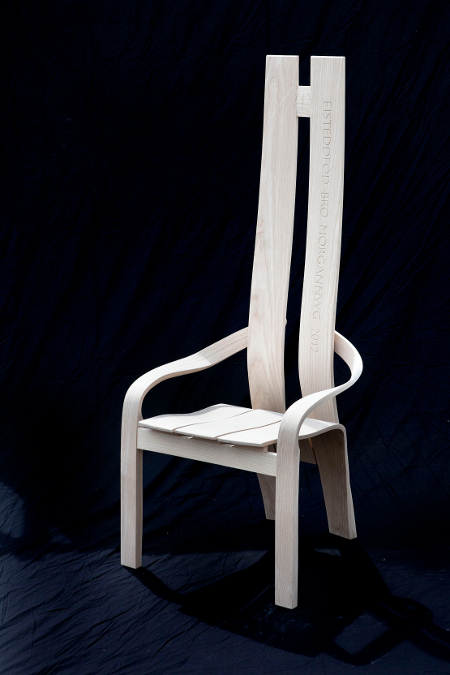 By rooting the form of the chair within the process and context of a poem, the piece is inspired by and, in turn, has become an inspiration for, the Eisteddfod tradition it helps to celebrate. Steaming wood results in it setting much harder than when in it’s natural state. Therefore Andrew has spent a number of years perfecting this technique to ensure that when strips of steam bent wood are glued to form a laminate the glue line isn’t visible. This creates much more visually appealing furniture, where the shape and movement through these components appears effortless and graceful. 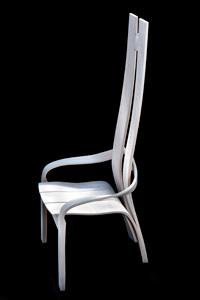 The added benefits of furniture made in this way are it’s strength and weight. 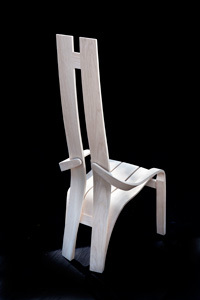 Whereas solid wood retains natural strength, it can be heavy. Laminates use less wood so are much lighter, while maintaining a physical strength that belie their appearance. 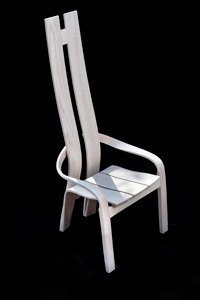 The Eisteddfod Chair is made from White Ash and measures 550 x 550 x 1700mm. The National Eisteddfod of Wales runs from 4-11 August 2012 in the Vale of Glamorgan (http://www.eisteddfod.org.uk/english/). Andrew Lane is available for interviews and/or photo opportunities during the run-up to the festival and with the chair during the festival, at times to be specified. Print and web ready images are available from the links below. 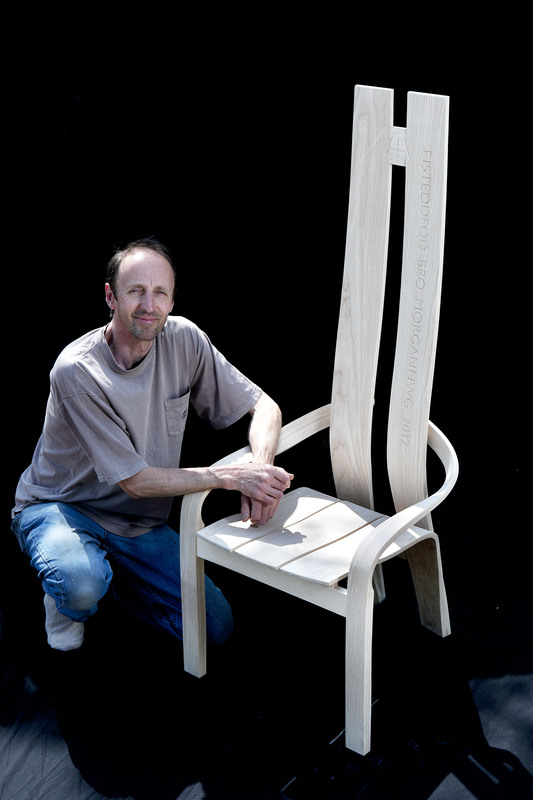 "The 2012 Eisteddfod Chair" (below) is a short film about the making of the Chair. It is embedded here and also viewable at www.andrewlanefurniture.co.uk/eisteddfod-film/ or on Vimeo. Andrew Lane will be appearing in ITV Wales’s “Eisteddfod 2012” programme on Thursday 9th August 2012. Please email via our contact page. These photographs by Nick Treharne can be used but please include a credit. Download the complete set at high resolution, or individually by clicking the thumbnails below and right-clicking the image this will display.